Данный модуль кодека распространяется в бинарном виде и отправляет анонимную статистику использования на сервера Digium. Такое решение продиктовано лицензионными опасениями Digium и не должно доставить неудобств. pbx1*CLI> config show help codec_opus opus opus: [category !~ /. ?/] Codec opus module for Asterisk options type -- Must be of type 'opus' sample_rate -- Codec's sample rate. packet_loss -- Encoder's packet loss percentage. complexity -- Encoder's computational complexity. max_bandwidth -- Encoder's maximum bandwidth allowed. signal -- Encoder's signal type. application -- Encoder's application type. max_playback_rate -- Encoder's maximum playback rate. max_ptime -- Encoder's maximum packetization rate. ptime -- Encoder's packetization rate. bitrate -- Encoder's bit rate. cbr -- Encoder's constant bit rate value. fec -- Encoder's forward error correction value. dtx -- Encoder's discontinuous transmission value. sample_rate -- Codec's sample rate. packet_loss -- Encoder's packet loss percentage. complexity -- Encoder's computational complexity. max_bandwidth -- Encoder's maximum bandwidth allowed. signal -- Encoder's signal type. application -- Encoder's application type. max_playback_rate -- Encoder's maximum playback rate. max_ptime -- Encoder's maximum packetization rate. ptime -- Encoder's packetization rate. bitrate -- Encoder's bit rate. cbr -- Encoder's constant bit rate value. fec -- Encoder's forward error correction value. dtx -- Encoder's discontinuous transmission value. 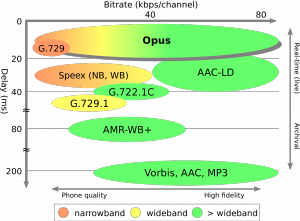 [opus] type = opus application = voip ; Encoder's application type. Values: voip (default), audio, low_delay bitrate = sdp ; Encoder's bit rate. ; Can be any number between 500 and 512000 as well as one of the following opus ; values: auto, max, sdp (default) ; When 'sdp' is specified the encoder is configured with the value given on the ; sdp. Choosing a default value of 'auto' if the format attribute is not found. cbr = sdp ; Encoder's constant bit rate value. ; True/False value where 0/false/no represents a variable bit rate and ; 1/true/yes is constant bit rate. Note, a special value of 'sdp' is also ; allowed. When 'sdp' is specified the encoder is configured with the value given ; on the sdp. Choosing a default value of 0 if the format attribute is not found. complexity = 10 ; Encoder's computational complexity. ; Can be any number between 0 and 10, inclusive. Note, 10 equals the highest complexity. fec = sdp ; Encoder's forward error correction value. ; True/False value where 0/false/no represents disabled and 1/true/yes is ; enabled. Note, a special value of 'sdp' is also allowed. When 'sdp' is ; specified the encoder is configured with the value given on the sdp. Choosing a ; default value of 0 if the format attribute is not found. max_bandwidth = full ; Encoder's maximum bandwidth allowed. ; Sets an upper bandwidth bound on the encoder. Can be any of the following: ; narrow, medium, wide, super_wide, full (default) max_playback_rate = sdp ; Encoder's maximum playback rate. ; Any value between 8000 and 48000, inclusive. Although typically it should ; match one of the usual Opus bandwidths. Note, a special value of 'sdp' is also ; allowed. When 'sdp' is specified the encoder is configured with the value given ; on the sdp. Choosing a default value of 48000 if the format attribute is not ; found. max_ptime = sdp ; Encoder's maximum packetization rate. ; The following values are allowed: 3, 5, 10, 20, 40, 60, or 120 (ms) Note, a ; special value of 'sdp' is also allowed. When 'sdp' is specified the encoder is ; configured with the value given on the sdp. Choosing a default value of 120 if ; the format attribute is not found. packet_loss = 0 ; Encoder's packet loss percentage. ; Can be any number between 0 and 100 (inclusive). Higher values result in a ; loss resistant behavior, however this has a cost on the quality (dependent upon ; a given bitrate). ptime = sdp ; Encoder's packetization rate. ; The following values are allowed: 3, 5, 10, 20, 40, 60, or 120 (ms) Note, a ; special value of 'sdp' is also allowed. When 'sdp' is specified the encoder is ; configured with the value given on the sdp. Choosing a default value 20 if the ; format attribute is not found. sample_rate = 48000 ;Codec's sample rate. ; Used to select the default codec. Must be either 8000, 16000, 48000. signal = auto ; Encoder's signal type. ; Aids in mode selection on the encoder: auto, voice, music dtx = sdp ;Encoder's discontinuous transmission value. ; True/False value where 0/false/no represents disabled and 1/true/yes is ;enabled. Note, a special value of 'sdp' is also allowed. When 'sdp' is ;specified the encoder is configured with the value given on the sdp. Choosing a ;default of 0 value if the format attribute is not found. ; sdp. Choosing a default value of 'auto' if the format attribute is not found. ; Encoder's constant bit rate value. ; on the sdp. Choosing a default value of 0 if the format attribute is not found. ; Can be any number between 0 and 10, inclusive. Note, 10 equals the highest complexity. ; Encoder's forward error correction value. ; default value of 0 if the format attribute is not found. ; Encoder's maximum bandwidth allowed. ; Encoder's maximum playback rate. ; Encoder's maximum packetization rate. ; the format attribute is not found. ; Encoder's packet loss percentage. ; format attribute is not found. ; Used to select the default codec. Must be either 8000, 16000, 48000.
;default of 0 value if the format attribute is not found.